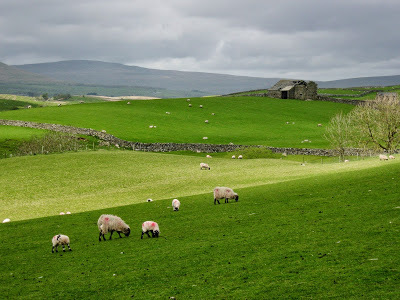 I spent a lot of time exploring the Yorkshire Dales as a youngster. My dad’s family is from the area, and we would go up most summers to spend a couple of weeks in the caravan. At the time I was obsessed with fossils and minerals, so the main focus of my activities would be splashing around in becks, searching for precious stones (and weighing down the car with boxes of specimens on the way home). 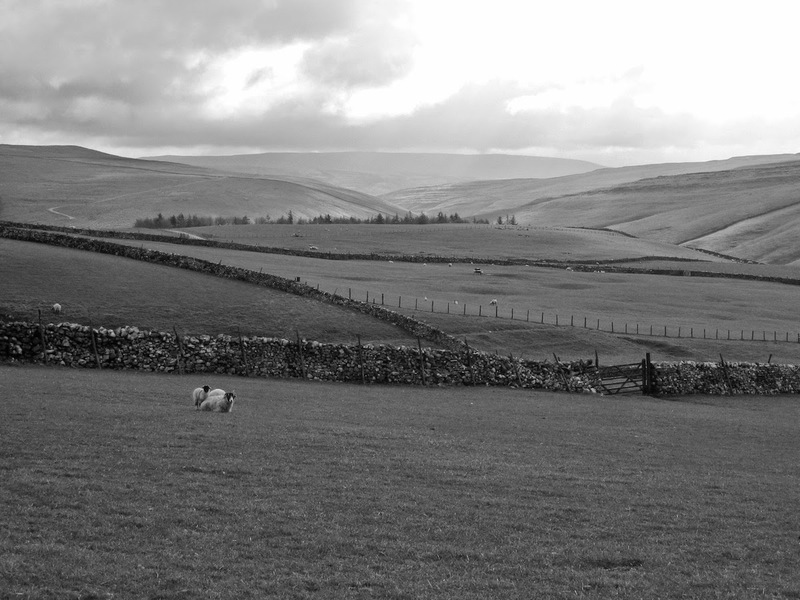 Little did I know that my time spent in the Dales would stealthily introduce another passion: the hills. 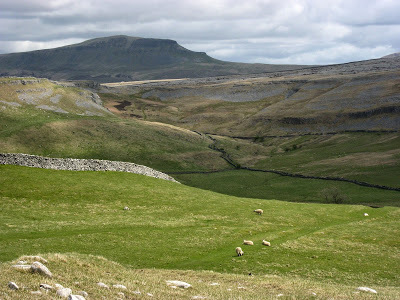 In fact, my first proper hill was Pikedaw, above Malham, when I was twelve years old. My last visit to the area was 2008. Since then I’ve been focused on bigger mountains, but with my departure date for the Cape Wrath Trail rapidly approaching, I wanted to get another short training mission done to test out a few new items of kit. This is the report of my trip. 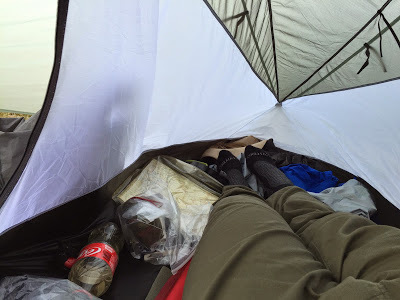 I’ve also included some observations on my failure to adequately deal with wet feet on day two, which had slightly uncomfortable consequences – fortunately no worse than that, although it has taught me a valuable lesson for the future. I’m still learning when it comes to using lightweight trail runners in the hills. 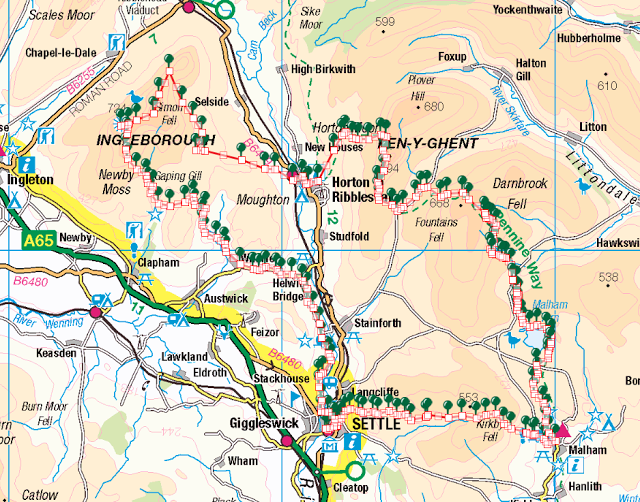 My route began and ended in Settle. Here is a link to the ViewRanger file. 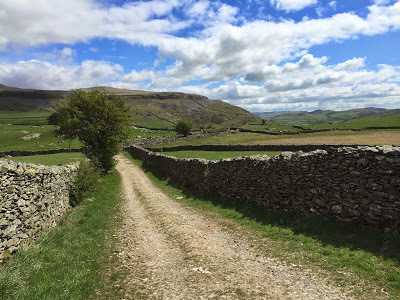 It’s a reasonably obvious circuit: head east to Malham, then follow the Pennine Way to Horton in Ribblesdale before tackling Ingleborough from the east and returning to Settle. The original route I planned deviated slightly from the Way between Malham and Fountains Fell, but given the bad weather on day two I decided to stick to the established paths. The overall length of this route is a shade over 37 miles. I tackled it over three days, beginning at 4 p.m. on the first day and finishing at 3 p.m. on the third. 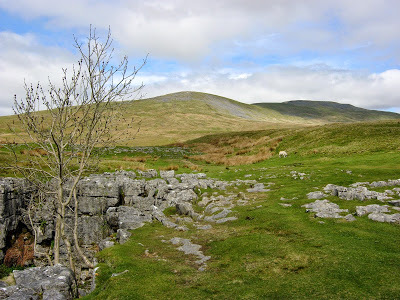 My campsites were at SD 901 672 (above Malham Tarn) and SD 769 736 (behind a wall near Nick Pot on the huge Sulber limestone plateau). 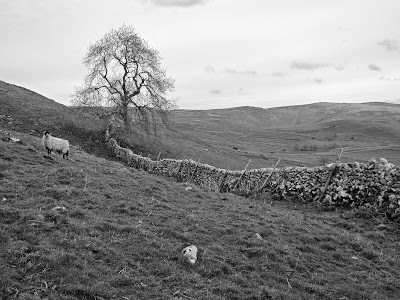 The weather was fair but overcast as I left Settle, rapidly climbing the Dales High Way on grassy slopes towards Attermire Scar. 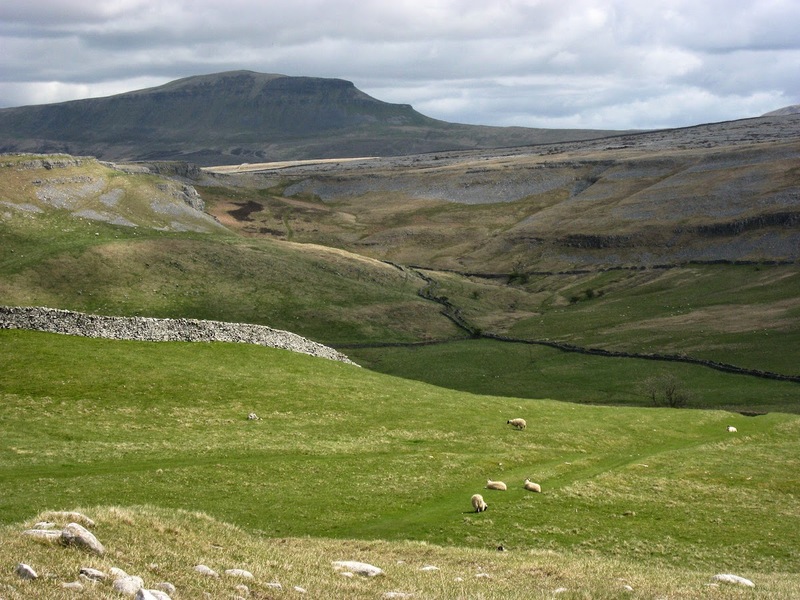 It doesn’t take long before the relatively built-up valley is left behind and limestone outcrops begin to dominate the hill pasture. This is a lovely section of walking. 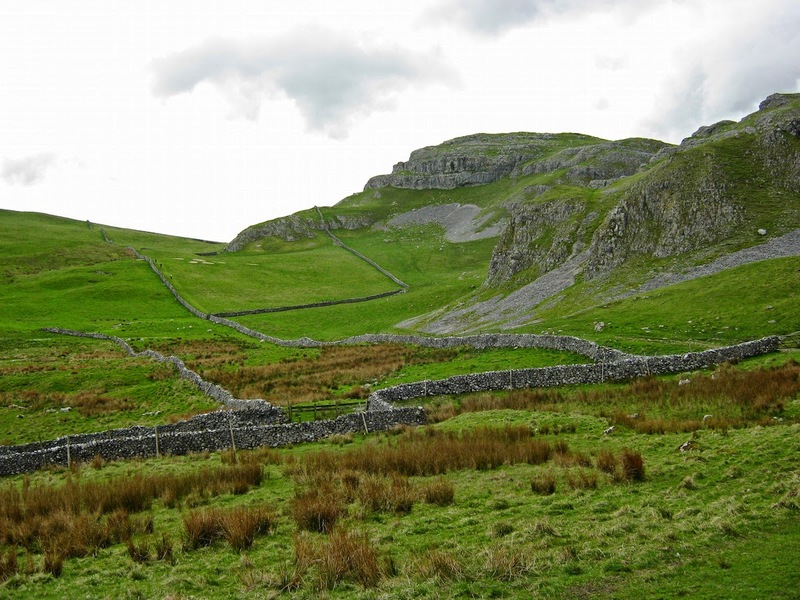 Attermire Scar is an impressive shattered corrie, all secret places and hidden caves. I vaguely remember seeing it as a child but coming back here as an adult immediately made me think of ancient landscapes from Tolkien – a place dense with natural and human history. This sense of a semi-mythical landscape was to follow me throughout the entire walk. 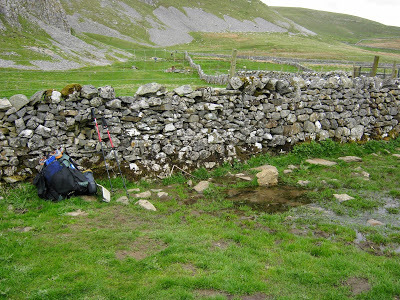 The ground is porous in limestone country, so becks – burns for the benefit of my Scottish readers – are relatively scarce. 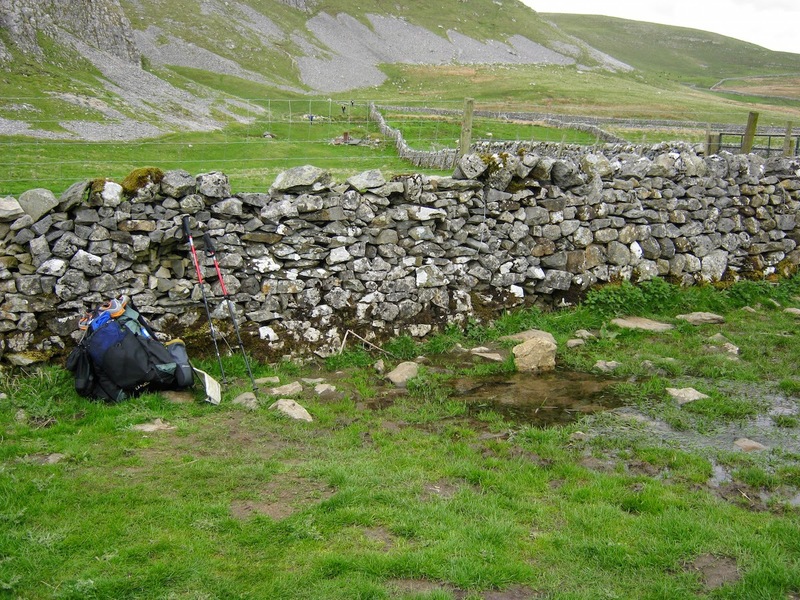 I knew I’d have to carry a bit more water than normal because many marked becks on the map would be dry. The first water source I encountered was a beautiful bubbling spring near Attermire Cave. Again the sense was reinforced that the surface of the land was merely the skin on a vast system, the majority of which was hidden and secret. Where did the water come from, and why was it being forced up from the depths of the earth? 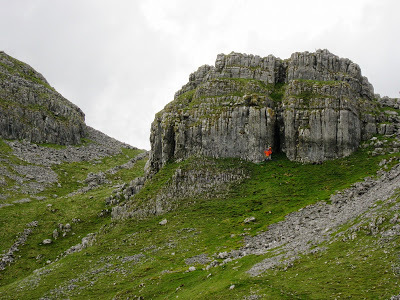 Who knows – possibly only cavers. 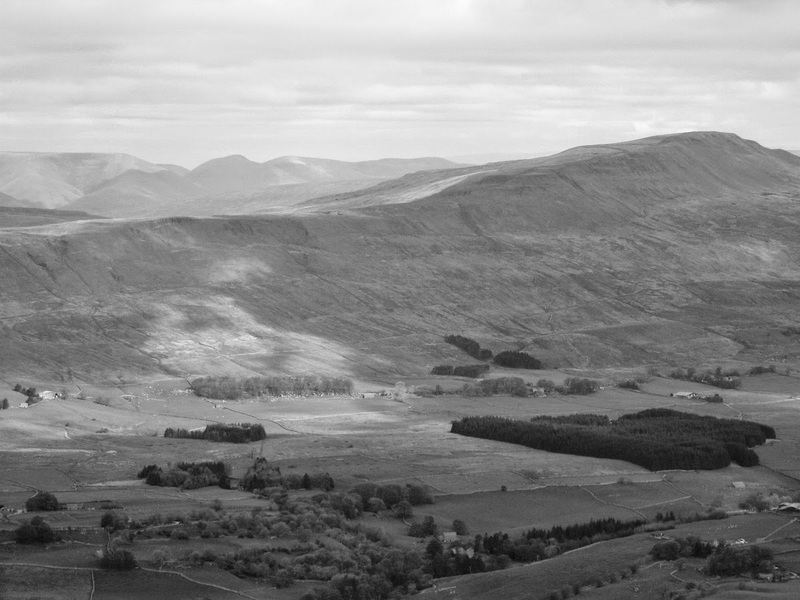 It got me thinking about how landscape is so much more than what is seen by the passing walker. I made rapid progress along the old road past Rye Loaf Hill and Kirkby Fell, soon dropping down to the steeper pass behind Pikedaw Hill. I remember coming up this way as a child, and as I passed the remnants of ancient mine workings the ghosts of old enthusiasms drifted to the surface … is this the mine where malachite could be found? I remembered the excitement of hunting for minerals and fossils. 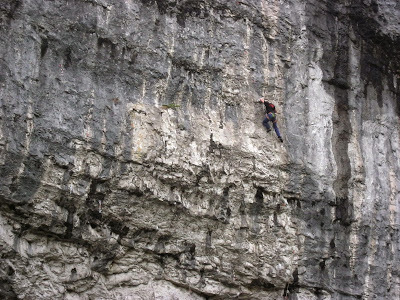 I dropped down to Malham. It was gone seven in the evening and the village was deserted. I pressed on, and fifteen minutes later marvelled at the novelty of having Malham Cove to myself – almost. There were no other walkers about, but climbers were larking about on the enormous overhanging cliff. Normally this is a busy path. Too steep for the likes of me. 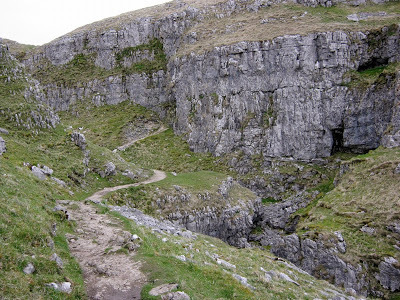 Malham Cove is another old place of inspiration for me. The water that emerges at its base has been on quite an adventure after disappearing underground about a mile uphill, at a place called Water Sinks. Once you know a little about the geology of this area it adds an amazing extra dimension to your appreciation of the walk. I recommend this page for a basic overview. 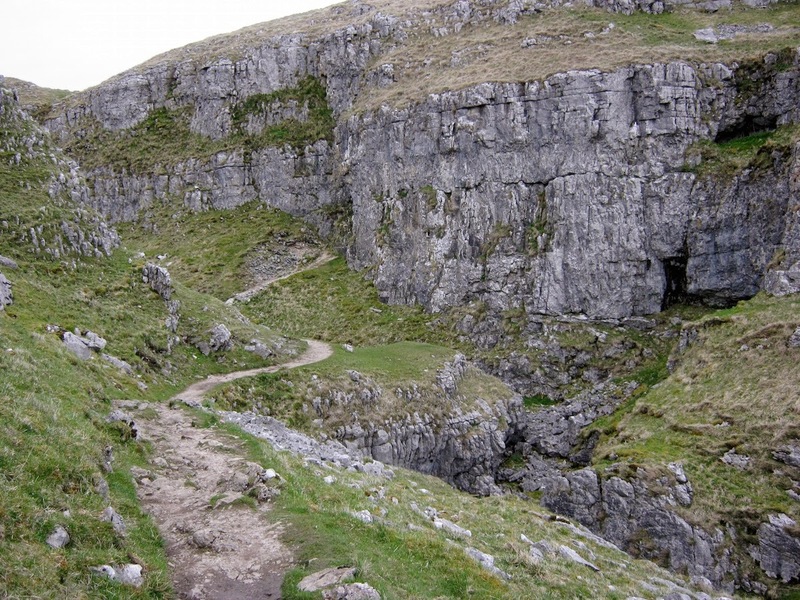 You’ll never look at limestone hills in the same way again. 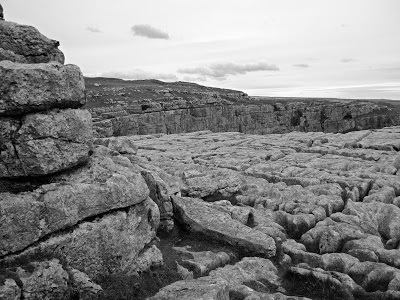 The limestone pavement at the top of Malham Cove is another impressive feature. 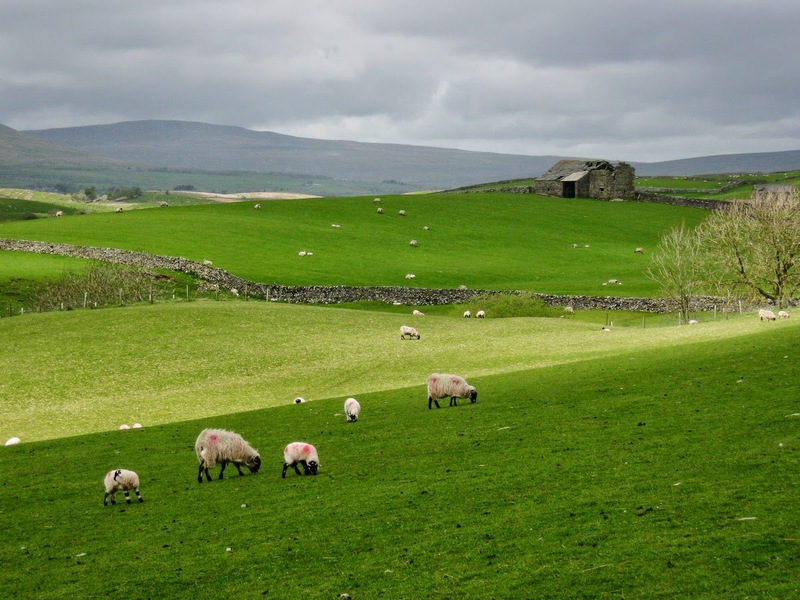 It’s easy to disparage the Pennine Way as a ‘tourist trail’, but let’s not forget that it passes through some of the most amazing and distinctive landscapes in the British Isles. 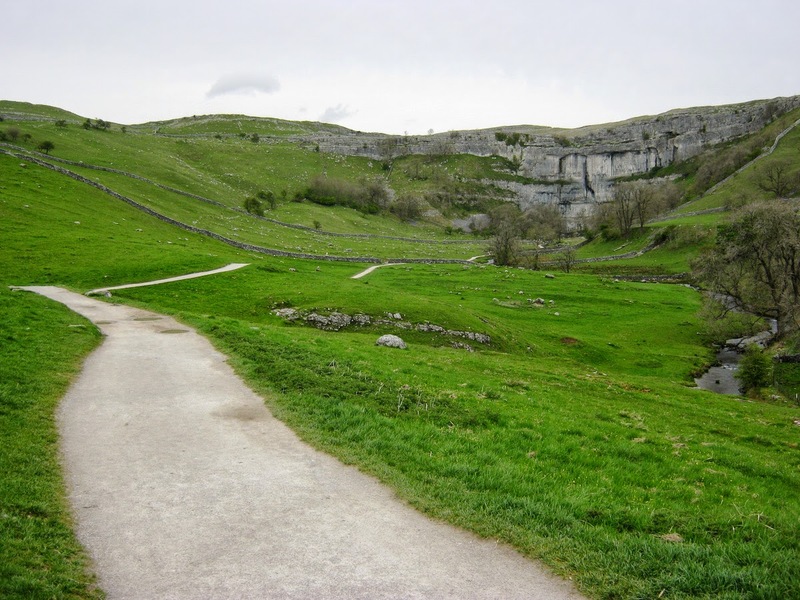 After the limestone pavement, the path takes you through the Watlowes dry valley – another geological marvel. Thousands of years ago, this ravine contained a massive torrent from a melting glacier on the higher ground above. Now the water takes a dark and silent path far underground. Watlowes. I was on the lookout for trolls. The wind was increasing by this point, and I was keeping my eyes open for potential campsites that might be sheltered. I considered a pitch in Watlowes but was reluctant to camp so near to the trail. The land above, near Water Sinks, was very exposed. 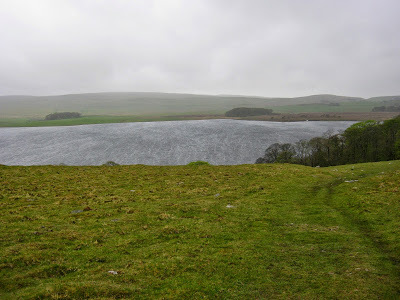 In the end I kept going to Malham Tarn where I eventually found a relatively sheltered spot some way above the lake. The wind starting to howl over the waters. 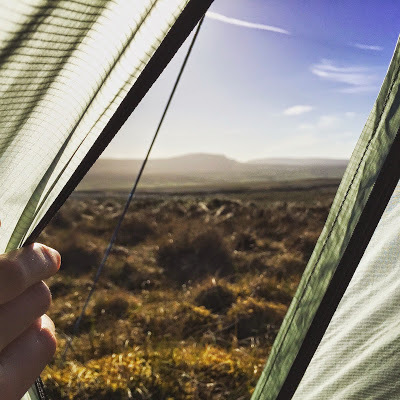 This was my first time using the Tarptent Notch in anger, and I have to say it coped very well with the galeforce winds overnight. (See my first impressions of this tent here.) The tapered ends cut into oncoming winds magnificently and the pole apex guylines held the structure rigid. Ventilation was excellent and there was no condensation to speak of. Thanks to my earplugs, I had a very good night’s sleep – but woke to heavy rain and even heavier gusts the next morning. I’d originally planned an off-path route over the high ground marked ‘Out Pasture’ on the map, then to follow Darnbrook Beck up Fountains Fell, but decided to take my ‘foul weather alternative’ which was to simply keep following the Pennine Way. 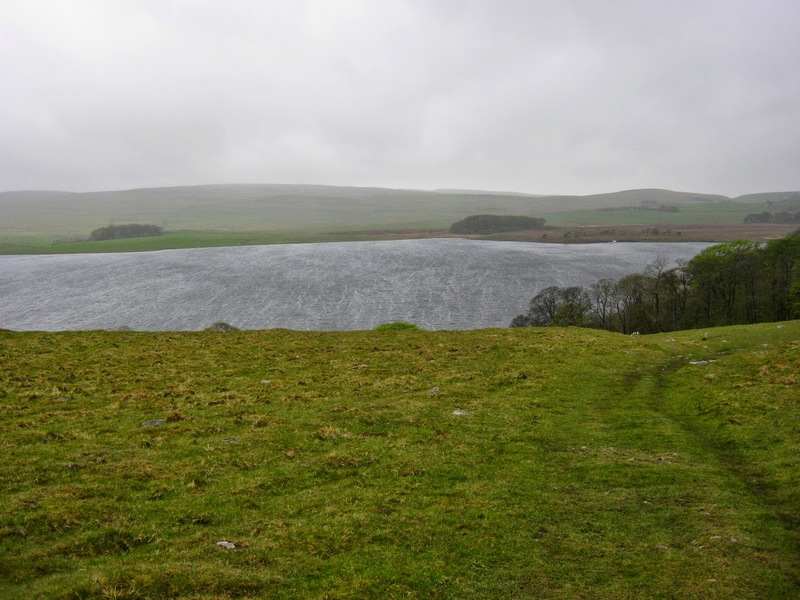 The first mile or so was a trudge in driving rain and sleet which didn’t let up until I started the ascent of Fountains Fell. Fountains Fell is a hill my dad has spoken of many times. 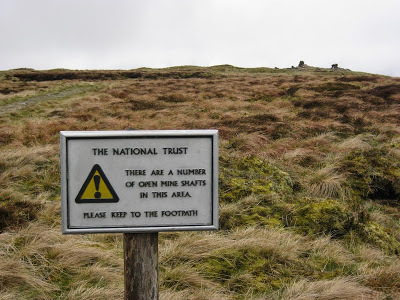 I’d never set foot on it myself, though, and he warned me about a bog at the top. 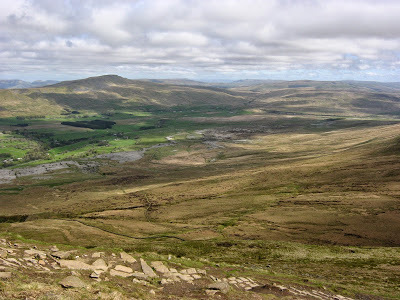 Nowadays a good trail cuts through the bog and I succeeded in reaching the summit plateau without any serious bog-squelching, although my feet had become wet from water splashing through the mesh uppers. 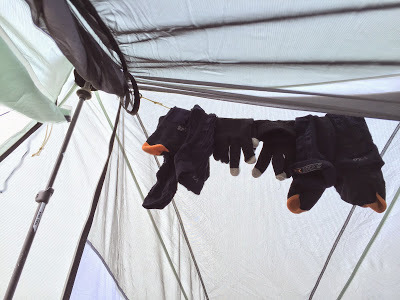 This was expected – I was wearing lightweight trail runners, after all – but given how foul the weather was I hadn’t begun my planned schedule of swapping socks every two hours to allow them to dry. I’d also promised myself I would stop every hour to air my feet (an important precaution in such conditions when wearing trail runners). However, again the foul weather deterred me from making these stops, and it was much too tempting just to press on and ignore my damp feet. The descent from the top was much boggier and a squelchy time was had, although the view was significantly better on this side of the hill. 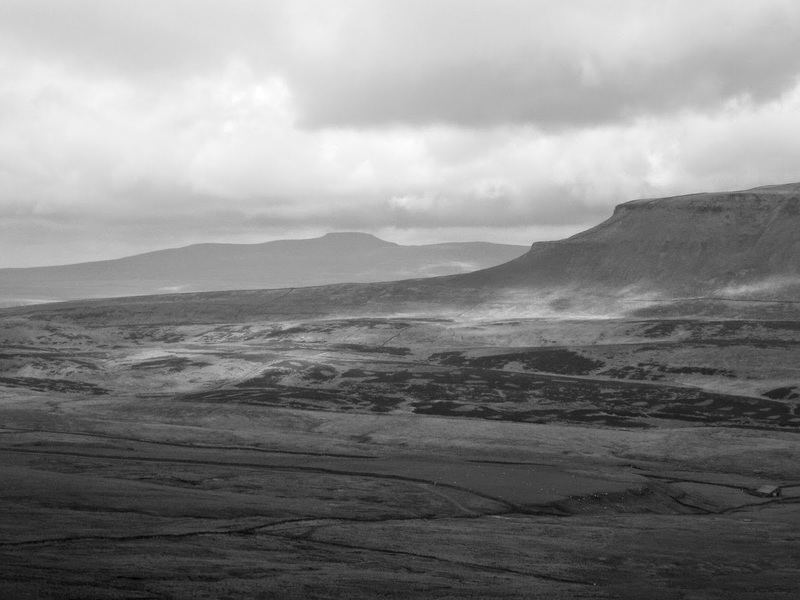 Pen-y-Ghent and Ingleborough looked starkly majestic – and also very remote. I was about fourteen miles into my route and this was my first real reminder of the distances I had yet to cover. Fortunately the weather was beginning to improve, with occasional breaks in the cloud base and longer pauses between showers. Still, I didn’t stop to dry my feet or change my socks; given the boggy ground, I thought it would be fruitless. With hindsight this was a mistake. I made good time to the start of the climb to Pen-y-Ghent. By this point the wind was on the increase again, but I found a sheltered spot and finally paid attention to my feet. They were wet and wrinkled. I let them dry for ten minutes and put on some dry socks, then attached the damp ones to the back of my pack to dry in the wind. 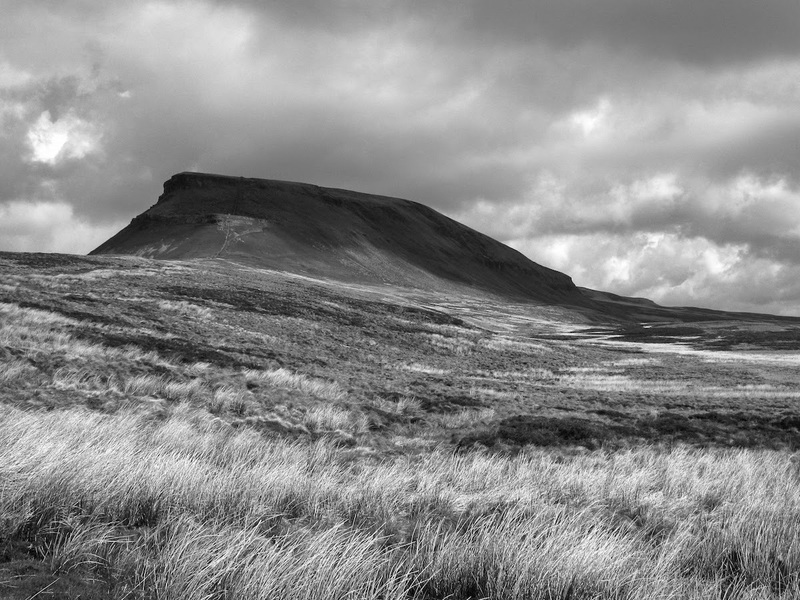 Pen-y-Ghent is a beautiful mountain, and it looks bigger than it actually is. The steep climb up the nose is deceptively short, although it features a brief section of easy scrambling. The wind was now so bad that a group of army cadets behind me decided to turn back when one lad was bowled over by a gust. I kept going, but I paid great care to my balance on the rocky section, and was thankful for my lightweight pack. The wind shrieked and howled through the gaps in the stone wall to my left, like a chorus of angry spirits defending their mountain against intruders. Maybe I had The Lord of the Rings on my mind again but I half expected to find the Ringwraiths waiting for me on the summit. I paused for a bite to eat at the summit shelter then pressed on. A long way still to go. On the way down I met a couple who had wisely decided to turn back, given that the wind was gusting 40mph+ and they were not particularly well equipped. I stopped to change socks and dry my feet again, but probably didn’t stop for long enough; my feet were still decidedly damp when they went back into damp socks and damp shoes. 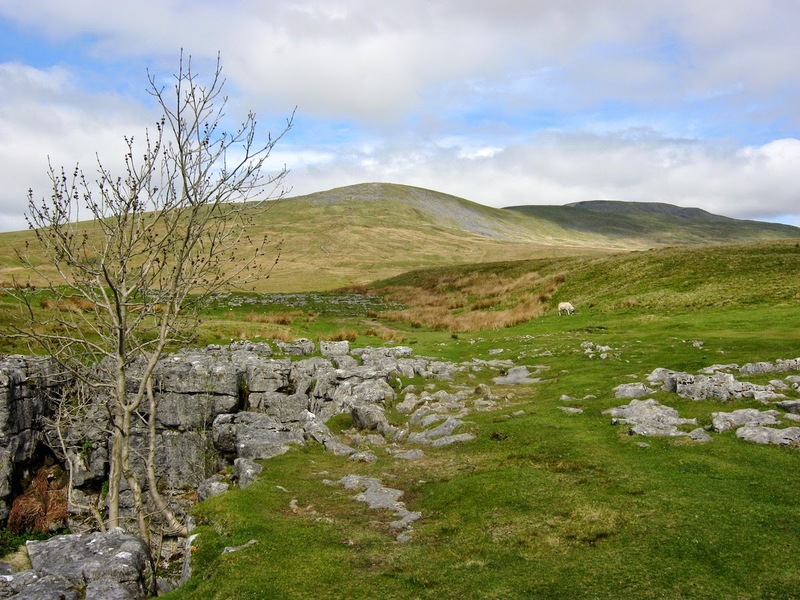 As I approached Horton in Ribblesdale I noticed that a point on the sole of each foot under the heel was sore. I inspected the damage, dreading a blister, but to my surprise I could see nothing at all. Back on with my shoes; again a slight but noticeable soreness with each step. When I reached Horton, I stopped for half an hour in the pub for a pint and a chance to dry my feet off properly. The soreness was a bit more pronounced this time, and the skin (which was still macerated, despite belated attempts to dry off) was a little red. Suddenly I remembered an occasion when this had happened to me before – I realised it was the first stage of immersion foot! Clearly I had not been taking good enough care of my feet. I set off from Horton at about three in the afternoon in another heavy rain shower, travelling along the path of Sulber Nick, which passes through more interesting limestone pavement. I was actually considerably ahead of schedule by this point, as I had intended to camp somewhere in this vicinity overnight. 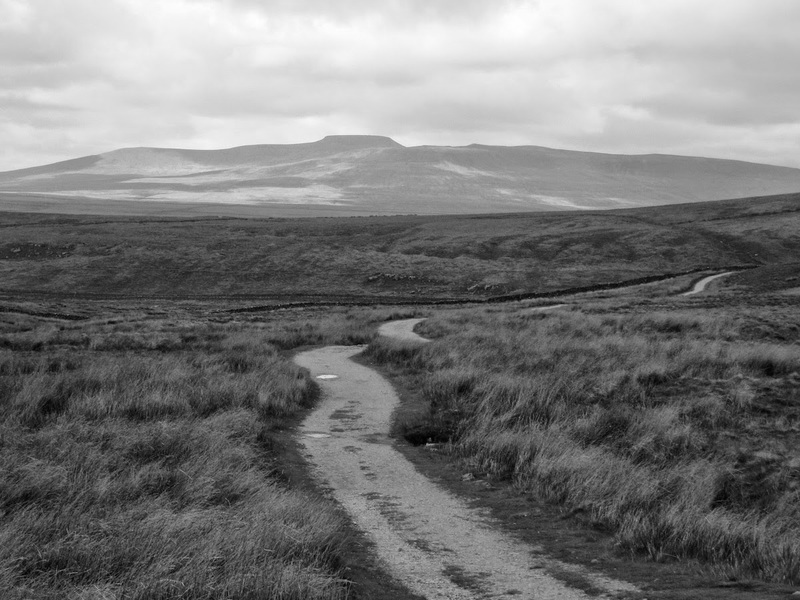 I took my time exploring the moors. Finally, at about half past four, I realised I could go no further without encountering steeper ground where good camping spots would be difficult to find. It was still windy at this point but the forecast was significantly better for the next day. I found a stone wall to use as a windbreak and pitched the Notch. Needless to say, the first thing I did when getting into my shelter was to take off my socks and take a proper look at my feet. This is where I made a slightly foolish error. I had brought some Gehwol Extra foot cream with me, which is highly recommended by walkers who use it to keep feet in good condition when faced with wet weather. 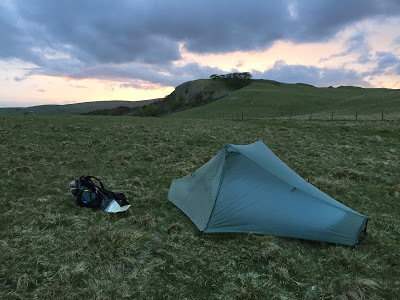 I’d never used Gehwol Extra before and was keen to assess its suitability before it earns a place in my Cape Wrath Trail pack. I slapped a good covering on to each foot in the belief it would aid recovery. The thing is, there are several different sorts of Gehwol cream. I later discovered that the Extra variety is a barrier cream, not a recovery cream. It’s my belief that applying it when my feet were damp actually prevented them from drying out properly, because about half an hour after going to sleep I woke up with very itchy feet – another symptom I remember from my last encounter with immersion foot. The interior of the Notch is surprisingly roomy. Pot cosy cooking. It really does work! I knew I’d overslept when I felt myself slowly roasting in my sleeping bag. The full sun was on my tent and it was already warm outside. I breakfasted and packed in less than half an hour, and was back on the trail by half past nine (later than I had intended). But what about your feet? I hear you cry! The itching was gone, replaced with a slight tenderness when taking a step, and again the soles were red beneath the heel. This was the point when I figured out that I had made a mistake in applying the Gehwol when my feet were still wet, because they did not dry out adequately overnight. Fortunately I’m more competent when it comes to my gear, and had made sure my shoes and socks were entirely dry. As an aside: I’m focusing a lot on my foot issues here, but at the time it was no more than a minor irritation. It certainly didn’t affect my enjoyment of the walk. Consider this post-hike analysis! 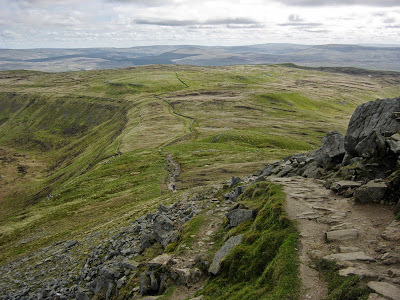 The ascent to Ingleborough’s summit ridge was a delight. I’d never climbed this mountain before, and it pleasantly surprised me. There was nobody else about, the skylarks were singing, and I could see for miles in every direction. What more could you ask from a hill? 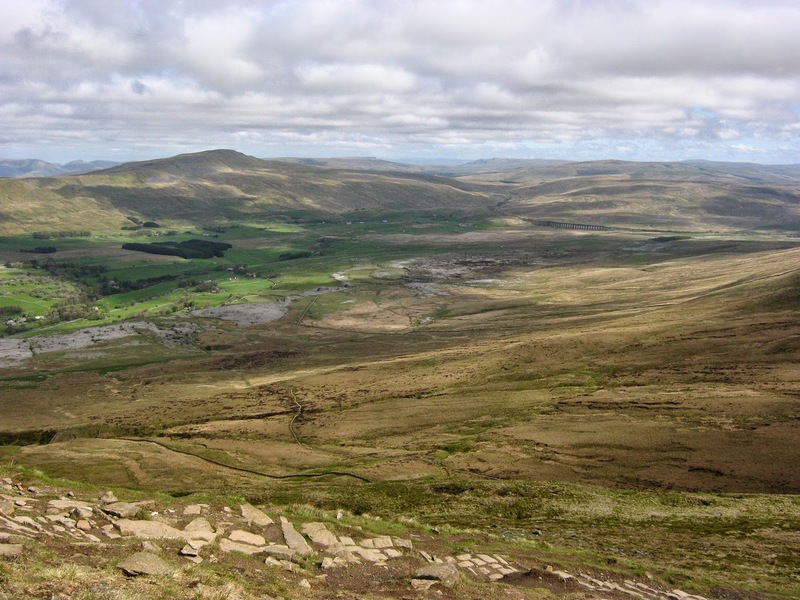 Wide views from near the top of Ingleborough. Looking back to the route of my ascent. 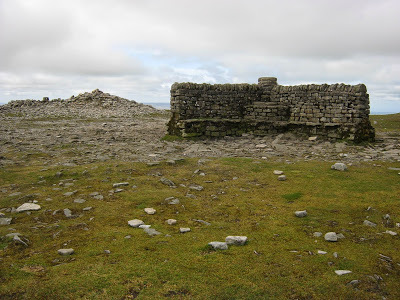 The summit itself is a robust cap of gritstone, a natural fortress; it’s no wonder that it was used as a stronghold in antiquity. I imagined myself as an ancient Briton patrolling the ramparts, watching the forested wilderness beyond for advancing Roman legions. The forests are mostly gone now, but it still looks prehistoric, doesn’t it? I had the summit to myself. There’s a very solid shelter right at the top. After stopping for a snack, I dropped down from the summit cap and took a traversing line east to find the south ridge path. 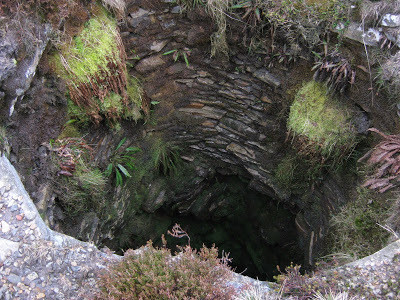 The traverse, along a natural terrace, was full of interest – the ground was liberally dotted with shake holes, some opening up to caverns, others filled with water. Again I was reminded that there is a lot going on beneath the surface of these hills. I jogged down the south ridge. My feet were feeling a little more sore, but I was making good time and the terrain was dry, so I didn’t bother to stop and air my feet every hour as I had originally planned. 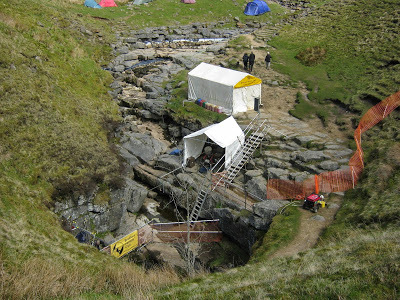 When I passed Gaping Gill, I saw an enormous encampment of tents and a semi-permanent-looking winch arrangement at the entrance. A sign identified the campers as members of the Bradford Pothole Club. The way down took me through some beautiful countryside. 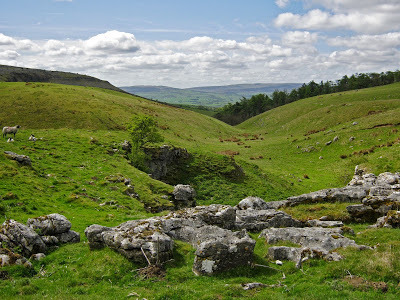 I trod delightful grassy slopes in an area marked Clapham Bottoms, then followed good paths to the top of Long Scar and down into Crummack Dale. A view back to Ingleborough. There were more walkers about that day, thanks to the great weather, and for a while I found myself walking with a group of ramblers who were looking for a bluebell field. 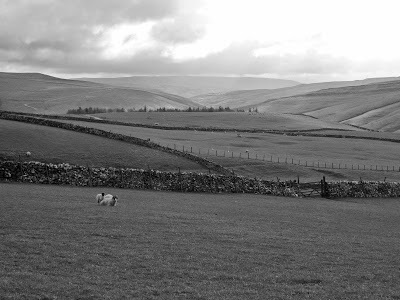 It was at some point after passing the hamlet of Wharfe that I became aware that the soreness in my feet was worse than it had been at the start of the day, and it seemed more painful when going downhill (as this placed more pressure on the soles of my heels). 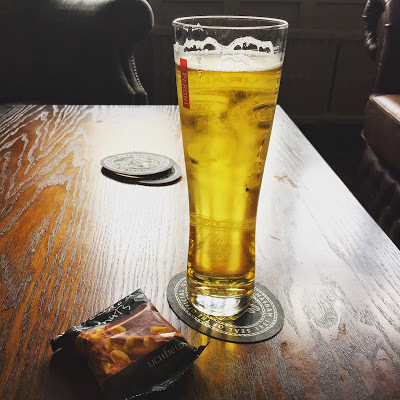 I stopped a couple more times to let my feet air, but not for long enough; the pint at the end of the journey was calling me on, and I had a train to catch. 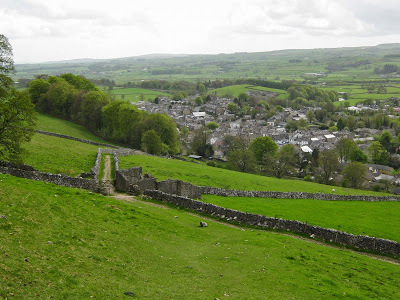 In the end I reached Settle at about three in the afternoon. 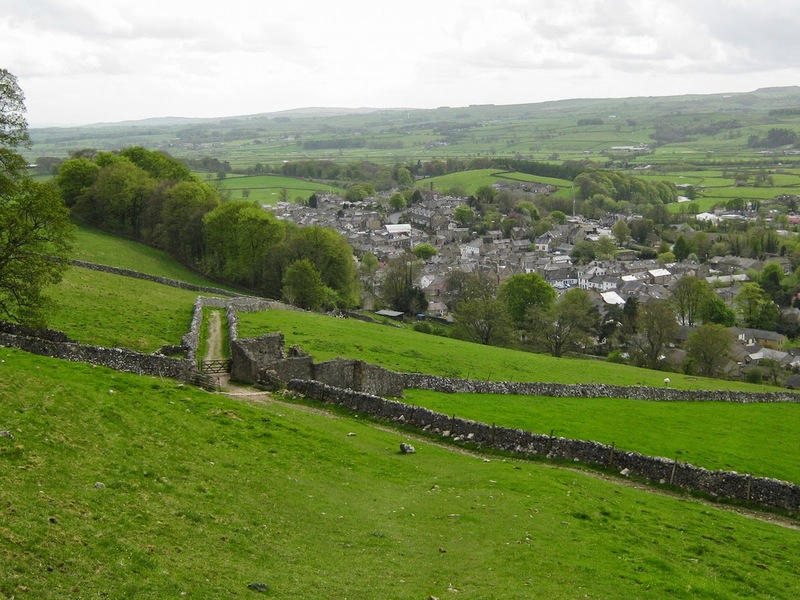 I was footsore, but overjoyed at having completed a stunning three-day walk in the Dales. The route I completed this week was great. It has grand hills, scenic dales, geological wonders, and the nature of the landscape stimulated my imagination every step of the way. I was accompanied by the trolls and goblins of my childhood imaginings as I walked. Certain places reminded me of locations from Tolkien, and as I strode out the miles I found myself constantly wondering at the subterranean secrets buried far beneath my feet. Most of my new gear acquisitions have proven themselves already. 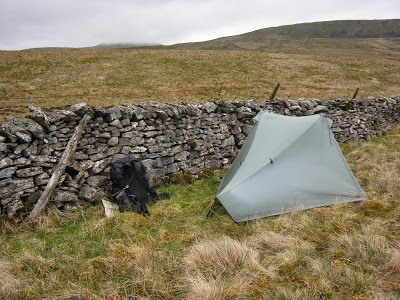 The Tarptent Notch was rock solid in high winds, and the ÜLA Circuit backpack was supremely comfortable. 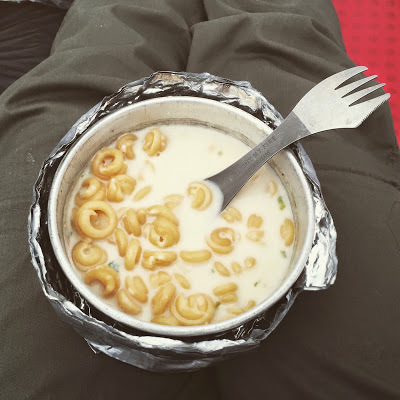 My first attempts at pot cosy cooking were completely successful and I think this technique will save me a great deal of fuel on the Cape Wrath Trail. Overall, this is the first time I’d been backpacking with a pack that light (less than 10kg including food) and it really made a huge difference to my experience on the trail. And I’ve learned a valuable lesson when it comes to foot care. Trail runners have many benefits – I have, after all, just walked 37 miles without a hint of a blister or much fatigue to speak of – but on wet days your feet are going to get wet. Keeping your feet as dry as possible is a challenge that needs to be taken seriously. I knew that already in theory, but a touch of immersion foot does tend to sharpen you up. A day later I’m happy to report that the soreness and redness is greatly reduced. Even on dry days, it’s important to regularly take off socks and shoes to let the feet air. On wet days, I’m going to rotate two pairs of socks on a two-hourly shift pattern. The drying pair will be attached to my rucksack or fitted over the handles of my trekking poles. Feet must be absolutely dry before going to sleep. Socks and shoes must be dried overnight. Gehwol Extra is a barrier cream to be applied in the morning to completely dry feet, to minimise maceration. It shouldn’t be applied to damp feet in the evening as I believe it actually helped to stop my feet drying out. On multi-day trips, foot care is really important! After years of suffering from blisters I finally have that one nailed down, only to find that my new strategy places me at higher risk from immersion foot. Every trip is a learning experience! Backpackers: any tips for dealing with wet feet that you’d like to share?